This is a sponsored conversation about Safer Internet Day. I’m part of the Mom It Forward Influencer Network. Guess what today is? It’s Safer Internet Day, so it’s the perfect opportunity to share some things I do to keep my kids safe on the Internet. This is a day that Google’s Kids and Families team wants you to know about and it’s goal is to keep kids safe on the Internet. My kids (ages 8, 11, and 13) are on their school computers all the time. Luckily, they have certain websites blocked, but mine are getting old enough to know what’s blocked and how to get around them, mostly to play games and go to YouTube. They all have their own devices too, so I make sure to stay on top of the websites they visit. I like to check up on my kids and what they do on the Internet. I’m not sneaky about it and they know I check up on them. I look over their shoulders and ask what they are watching or who they are texting. I’ll skim over texts to make sure everyone is being appropriate. I’ve done this from the very beginning so they’ve never complained about it. I can tell which of their friends don’t have parental supervision too. Check the history on the device. You can find out everywhere on the Internet your child has been. If you don’t know what the website is, go check it out to make sure it’s age appropriate. If the history has been cleared, ask why. They could have been trying to get rid of evidence of being somewhere they weren’t suppose to be. I know this is so hard because my kids ask for it all the time. Kids don’t realized that once something is on the internet, it’s there forever. Colleges and future employers look at these places to learn about their candidates. I was reading an article in the Washington Post and it stated that anxiety is the leading mental health issue in American teens and it’s only getting worse and one reason that’s causing this is social media. Make sure you know passwords to computers, email, and social media accounts so you can check up on them. We have it set up so that when my kids want to download an app, I get a pop up on my screen asking for permission. I know everything that’s on their device. Check out this Google Family Link. This is a great app that lets you track where and how much time your child is on each application. You can also set up time limits, which I LOVE!! So…because of Safer Internet Day, Google wants your kids to Be Internet Awesome. When you click over to their website you can read the program’s New Family Guide, play games to put their skills to the test, and you can even print out an Internet Awesome Pledge. They help teach your kids to be Internet strong, alert, smart, kind, and brave. It contains some real life examples on what your kids can do it certain situations. There were some things I hadn’t thought about when I read over it, so I know you’ll get some helpful tips too. I encourage you to have these conversations with your kids and teens. Talk with your child’s school and make sure you know everything they are doing to keep our kids safe. This would be a great lesson for teachers to give one afternoon. Make sure to address any concerns you have about the school’s Internet safety with your child’s teacher and principal. What are some things that you do that help keep your kids safe on the Internet? 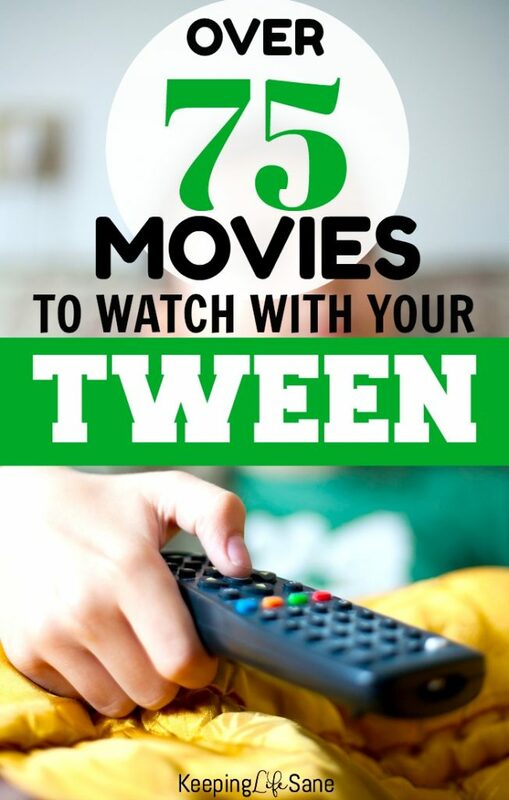 Good movies you can watch with your tween.